See your Fault Tree data come to life in an actionable, impactful format. 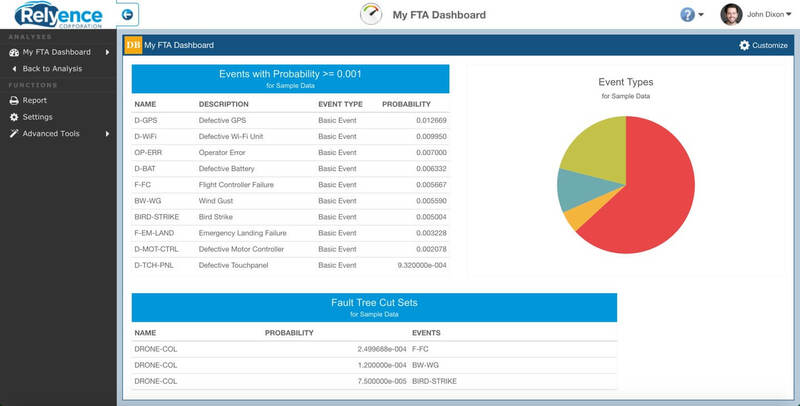 The Relyence Fault Tree Dashboard provides an at-a-glance overview of your risk and safety related metrics. 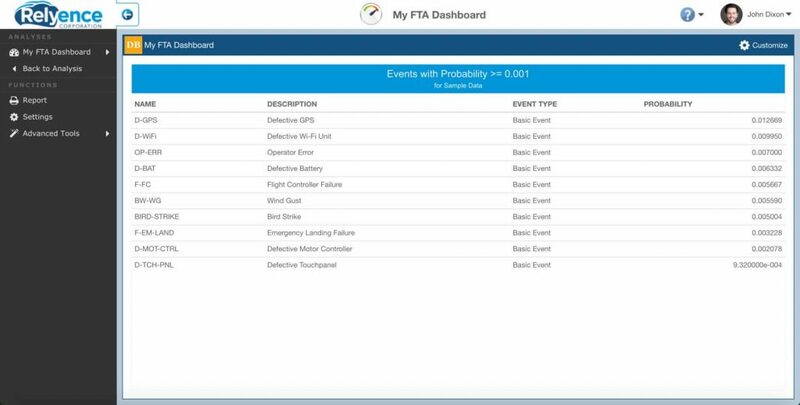 Combining all the data you need for quick assessment, the Dashboard offers the ability to monitor and manage your fault tree analyses with efficiency and effectiveness. This focused overview enables you to quickly gauge system health, empowering you to react proactively to maintain your risk and safety objectives and turn insight into action. 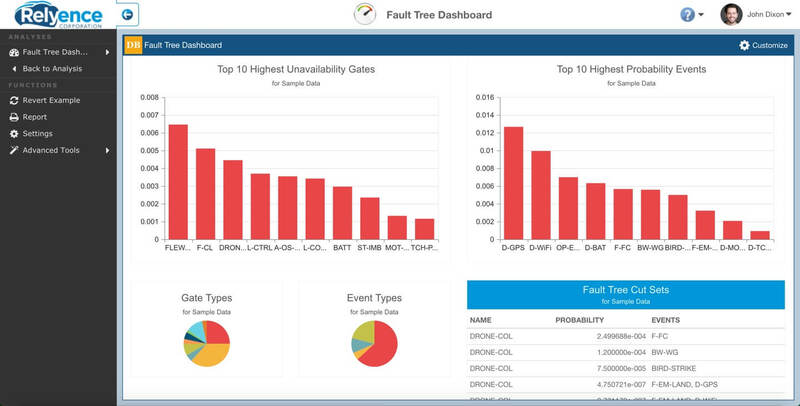 The Relyence Fault Tree Dashboard can provide high level visibility across a single analysis, a group of analyses, or your entire system operation. 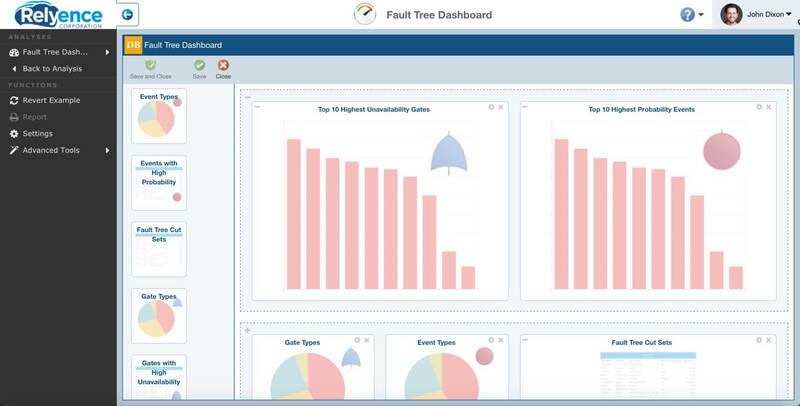 The Relyence Fault Tree Dashboard gathers and organizes your fault tree risk metrics to provide a holistic overview of your analysis. You can use the Relyence Fault Tree Dashboard to quickly view your highest probability events, your most important gates, and your minimal cut sets. The Relyence Fault Tree Dashboard is useful for managers, analysts, engineers, designers – any or all team members. As with all well-designed dashboards, the Relyence Fault Tree Dashboard allows team leaders as well as contributors to gather information in real-time and react to keep risk and safety objectives on track. While the Relyence Fault Tree Dashboard provides a high-level overview, the underlying data is always available at your fingertips with the click of your mouse. The Relyence Fault Tree Dashboard’s drilldown feature takes you from a chart, table, or graph directly to the corresponding analysis information. Want to drill down to the gates with the highest unavailabilities? Click on the gate or gates in question in the list and go right to the fault tree with the details. As a manager, would you like to keep track of your top 10 highest probability events? Keep the list on your Dashboard and click on any one at any time to view individual critical event information. The Relyence Fault Tree Dashboard Designer allows you to drag and drop widgets on the palette, positioning and sizing them as you desire. The Relyence Fault Tree Dashboard is completely customizable, so you can create a dashboard suitable for your needs, or create any number of dashboards. You can define the look and layout of your dashboards, as well as specify properties of your various charts and graphs. You can combine data from other Relyence modules into a single dashboard for a comprehensive overview of system health. Event Types: A pie chart showing the breakdown of event types used across your fault trees. Important Events: A listing of events that you designated as important.